When Yekwon Sunwoo first appeared at the Van Cliburn in 2013, at 24, he didn’t make it out of the preliminary round. Video of his performance in 2013 is available on Youtube. Over two recitals, he performed a reworking of a Strauss waltz, Beethoven’s Sonata No. 13, Schubert’s Wanderer-Fantasy, some Scarlatti, some obscure Schumann, the required contemporary work by Leon Kirchner, and Ravel’s La Valse (which is the first track on his 2017 disc). He was prepped in a tuxedo jacket, bowtie, wire-rim glasses and a standard engineer’s haircut grown in about two weeks. He committed no obvious errors and did nothing that one might consider in poor taste, yet failed to make an impression. This year—four years later—a different character emerged. The glasses and bowtie were gone, the increasingly antiquated formality of the tuxedo jacket was replaced by a more contemporary sports coat and Steve Jobs-esque black T-shirt, and the utilitarian hair by what must be referred to as a K-pop side-swipe. And amidst the stalwart classical edifices in his chosen repertoire, a similarly suave new flavor found its way into the mix: a predilection for early 20th century works that parallel the expanded tonality of American Jazz of the time—the works, more or less, that were chosen for this CD. Sunwoo doesn’t really belong in a cold and sterile concert hall with the expectations of centuries bearing down on him, but a small corner by the bar in one of those places that are only accessible through an alley, with no one actively paying attention to him beneath the soft din except one man sitting by himself three tables over nursing his fourth martini who will not be certain the next day if what he remembers hearing was the playing or the alcohol. Sunwoo seems to harken back to the time when Jazz was about the feeling in between the notes of standard notation—before Jazz accumulated arguably more theoretical pretensions than the classical tradition. He approaches this tonal window—after Romanticism proper but before atonality—as something new coming together, a new language congealing, not something old falling apart. (Someone should nudge him towards Scriabin’s catalogue.) There is something casual about the way he plays classical repertoire that can seem underwhelming upon first impression, but very fresh musically once you adjust your expectations. Sunwoo isn’t the type of pianist to concern himself with the grand sweep of history or any kind of cataclysmic clash of ideas or civilizations. He performs music entirely in the present, as one living heart to another. He is a human-sized contemporary pianist—with a sneaky amount of depth (the works he performed that are not on the CD are Beethoven’s Sonata No. 30, Prokofiev’s Sonata No. 6, Schubert’s Sonata D. 958, a Dvorak Quintet, Mozart’s Concerto No. 21 and the Rach Third). There is also a Jazz interrogation of canonicity and authorship itself in Sunwoo’s repertoire. La Valse started as a ballet and was later transcribed by Ravel for both one and two pianos, but also exists in several independently transcribed versions in multiple player configurations, including one by Glenn Gould. Two works (Percy Grainger’s “Ramble” and Liszt’s Schubert transcription) are re-castings of material originally written by other composers. The commissioned work is a contemporary setting of a French Renaissance song from the 15th century. Rachmaninoff’s Sonata No. 2 was heavily edited by the composer twenty years after it was originally written, but exists in the public’s mind in a “compromise” version assembled by Vladimir Horowitz. Sunwoo’s La Valse is notable for its overall coherence. 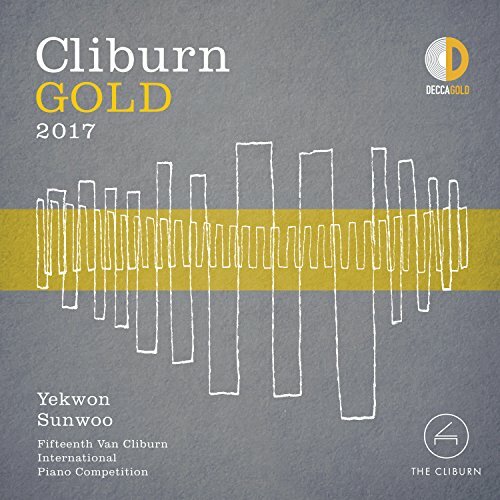 A work that is often described as a tribute to the waltz genre that pushes the genre to its logical limit and then hurls it off a cliff, and which is structured in contrasting sections originally given to different sections of the orchestra, Sunwoo does a remarkable job of maintaining a single musical thread throughout this difficult, relatively long and sprawling one-movement leviathan. The required commissioned work by Marc-André Hamelin (not Charles Richard-Hamelin) is entitled “Toccata on L’homme armé,” referring to a secular song that was used in over forty known settings as a cantus firmus during the Renaissance, and which may have originally been a call to arms after the fall of Constantinople to the Ottoman Empire in 1453. A simple melody of about four lines, Hamelin fleshes out the declamatory plainsong with a piano texture based on rapidly alternating hands. As in the Ravel, Sunwoo’s inclination to organize the music—at times, it seems, in spite of the composer’s intentions—to find beauty in chaos, as it were, is evident here. It is not that he makes technically difficult music sound easy; it’s that he makes it sound musical. The highlight of this album is not the most technically difficult. The Australian-born Percy Grainger began writing his “Ramble on the love-duet from Strauss’ Der Rosenklavier” in 1920, but only completed it after his mother Rose committed suicide in 1922 by jumping from the Aeolian building in Manhattan while Percy was on tour on the West Coast, after being confronted about carrying on an incestuous relationship with her son. It is said to be among the most heavily notated works not only in Grainger’s canon, but in all of piano literature. It consists mostly of a gently sorrowful theme interspersed with commentary and arpeggios in the mid- and upper-registers. Sunwoo’s version allows the piece to speak for itself, with great use of negative space, while at the same time giving the interstitial material a level of clarity and articulation that only a virtuoso could give. The Liszt-Schubert transcription is in a similar vein, although with fewer notes to articulate and, of course, from an earlier musical era. The Haydn sonata is the least interesting of the works on the disc. It is well-played, but you get the feeling in comparison to the other works that Sunwoo is being constrained here by the perfectly even division of beats. His Rachmaninoff Sonata No. 2, however, comes off as a completely new reading of the work. Largely episodic and atmospheric, with a free-floating use of thematic material, this tone poem for piano is highly susceptible to the temperament of the interpreter. Where Horowitz’s version is dry, snarling and fragmented, Sunwoo’s interpretation is organic and sensuous, without the dynamic and textural extremes of the Horowitz. The middle movement is so effusive it almost gives off a perfume. The outer movements roll off his fingers with an effortless charm, always searching for the musical content in the writing. For Sunwoo, the music takes precedence over any showcasing of technical ability. With ritual solemnity, the Van Cliburn International Piano Competition, the world’s biggest in terms of visibility and prizes, unfolds every four years in Fort Worth, Texas, where its famous namesake lived. Gold medalists go home with a cash award of $50,000, three years of concert management and bookings, a commercial recording and concert attire by Neiman Marcus. A handful of gold, silver and bronze medalists have based successful careers on their contest victories. Many have faded from view. Even so, the hope of turning up another Van Cliburn springs eternal. The latest Cliburn wannabe to emerge from that prestigious fray is Yekwon Sunwoo, a boyish-looking, slightly built, 28-year-old virtuoso from South Korea, who took the gold at the 15th Cliburn competition in June, when he beat out some 30 other competitors. As part of the global performance itinerary that’s part of his winnings, he made his Chicago recital debut Friday night at a sold-out Mary B. Galvin Hall at Northwestern University. He scored big with the crowd, as you might expect from a pianist who commands a comprehensive technical arsenal that allows him to thunder without breaking a sweat. But what impressed me the most was his remarkably mature musicality. Excellent training helped: Sunwoo studied with the respected pianist-pedagogues Seymour Lipkin and Richard Goode and holds degrees and artist diplomas from three top American institutions — the Curtis Institute of Music, Juilliard School and Mannes School of Music. He presently studies in Hannover, Germany. A couple of cautionary lights went off in my mind in the course of the pianist’s absorbing program, but most of my first impressions were very positive. I heard much tonally ravishing pianism that went well beyond the predictable crunching virtuosity and impeccable digital accuracy to reveal a genuine poetic sensibility, a way of making the music his own and telling you things about it you had not heard before. Sunwoo’s powerful, flying hands can do anything he puts his mind to at the keyboard. Fortunately, his mind appears to be teeming with thoughtful musical ideas that he conveys to the listener with a winning warmth and directness of expression. Not every competition-approved young hopeful has that ability, which is one reason I will be monitoring his career odyssey with unusual interest. He demonstrated his classical bona fides at the outset, with a serious and searching account of one of the late Schubert sonatas, the C minor, D. 958. He kept the surging, quasi-Beethovenian drama of the challenging first movement very much at the fore, his forte playing gorgeously rounded, never harsh. Fine detail was duly observed, but so, too, were the structural signposts. The slow movement was a serene song without words, rendered with the utmost sensitivity and exceptional tonal refinement. In lesser hands, the finale can feel overly long. Not this time: The pianism was invested with a crisp rhythmic elan and instinctive grace not given to many pianists of Sunwoo’s age or experience. No mean pianist himself, Rachmaninov once observed that he wrote his Third Piano Concerto “for elephants.” As much could be said about his Second Sonata, a fire-breathing behemoth that’s best left to pianistic pachyderms like the great Vladimir Horowitz. Tackling the composer’s 1931 revision, Sunwoo unleashed an impeccably controlled torrent of sinewy sound for the big bravura pages, supple lyricism for the more tender sections. And he did so with an effortless virtuosity, ardor and sweep that made this music feel like something deeper than Lisztian glitter retrofitted with a Russian accent. Technically speaking, Sunwoo’s Ravel was just as jaw-dropping as his Rachmaninov. The hard brilliance of sound he drew from the Steinway, sometimes at breakneck speed, was astonishing to behold. The pianist made a flat-out showpiece of it, which was fine except that all that queasy manipulation of the waltz rhythms disturbed the musical continuity. Clearly mine was a minority reaction, for the crowd clearly ate it up. I found more to enjoy in his treatment of two bonbons. Percy Grainger’s so-called “Ramble” on the love duet that ends Strauss’ “Der Rosenkavalier” is perfect little musical gem, awash in delicate arpeggios, with silvery echoes of Octavian’s presentation of the rose to Sophie from earlier in the opera. Sunwoo played it wonderfully. Why don’t more pianists perform this piece? Surveying the chilly waters of Lake Michigan just beyond the 30-foot picture window of steel-reinforced glass that flanks the stage of Galvin Hall, Sunwoo told the audience he found Tchaikovsky’s evocation of the month of October, in that composer’s “The Seasons,” “appropriate to this view” — and that’s what he offered as his single encore. Lovely. It’s left for Sunwoo to further develop his remarkable artistic potential in the demanding crucible of global performance. He is a young talent of exciting promise. One wishes him well in his solo career odyssey.